E Hackett showing how its done! A meeting in 1918 marked the formal beginning of golf in Enniscrone. The first recorded mention of the club appeared in the Western People, August 19th,1922 when it was announced that “medal competitions” were being held at “Enniscrone Golf Links”. Golf was then played at three locations in Enniscrone, at Bartra, Kilcullens field (behind the chapel) and at Scurmore Hotel on either side of the entrance avenue. The number of golf holes varied from nine to four to six respectively. It was not until 1930 however, that nine holes were laid out on flat land at Bartra and the course was formally opened with a membership of forty-eight on St. Patricks Day 1931. The membership fee for the year was £1. The club employed a greenkeeper in 1933. His fairway mower was horse drawn and a lawnmower cut the greens. In 1947, a clubhouse was built at a cost of £400. However war, emigration and economic depression throughout these difficult times combined to produce a declining membership and by 1959 there were just 14 club members. The building of a power station at Bellacorick and the Moy drainage scheme in the sixties brought a revival and with it came prosperity and new golfers to the area. In 1963 the club entered a team in the Connacht Shield competition – the first time the club became involved in interclub competitions. By 1969 membership had grown to just over a hundred. The course was in good condition but livestock on the course presented problems necessitating wire fencing of greens.Revival encouraged ambition. Members began to look longingly at the dunes and dream of an 18-hole links course. By March, 1970 the great course designer, Eddie Hackett was at work in Enniscrone. Working alongside a dedicated and hard working committee, he shaped and blended holes through the dunes that interfered very little with the natural terrain. It was here that Hackett built some of the best golf holes of his long and distinguished career. In 1972, the aquisition of a new lease agreement was very important for the club and allowed wire fencing of the course (12 miles of it !) to exclude livestock. 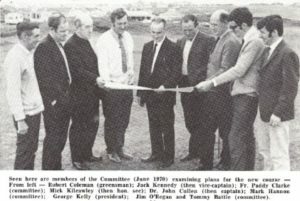 With just two permanent employees along with the generous voluntary labour of members, a pioneering spirit and a will to succeed saw the course and a new simple clubhouse opened in August, 1974 with Eddie Hackett driving the first ball. This was followed by an exhibition match featuring golf professionals Christy O Connor Sr. and John O Leary.